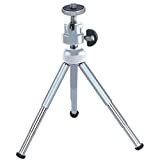 Attach your photo or video camera to the mini tripod to capture images from various angles in both portrait and landscape mode. Equipped with extendable legs and an adjustable ball head. This entry was posted in Discount Photography and tagged Camera, Konig, Mini, Photo, Tripod, Video by Ball Photo. Bookmark the permalink.